Far too many people involved with CPM scheduling at any point in the process really do not understand what CPM logic is telling us and because of this misunderstanding make many logic construction mistakes and misinforms the schedule users and reviewers. Essentially making useless hard to follow schedules. The CPM creator, the CPM reviewer, and the CPM user fail the make proper use of CPM through misreading the logic workflow. CPM is essentially a language of logic and like all languages must be correctly understood and used for it to properly communicate and provide direction. Relationships are the brain of CPM. A CPM schedule is an estimate or projection based on the creator’s experience, past projects, industry knowledge and what he or she knows about the project when the schedule is being created. No one can be certain about the future; an educated guess is all we can muster. There are essentially two types of schedule logic. The first one requires physical knowledge of what is being constructed or done, it is called Hard (physical or mandatory) logic. If there is no practical/achievable alternative then the logic is hard and the CPM must contain this logic. The second logic type is Soft (preferential, the schedule creator’s choice) it is opposite to Hard or can be accomplished in more than one way or in one sequence. So essentially your CPM schedule logic requires workflow knowledge and good preferential planning. For instance, you cannot make the final connections (water, air or power) to a piece of process/manufacturing equipment until the equipment is set, leveled and anchored. 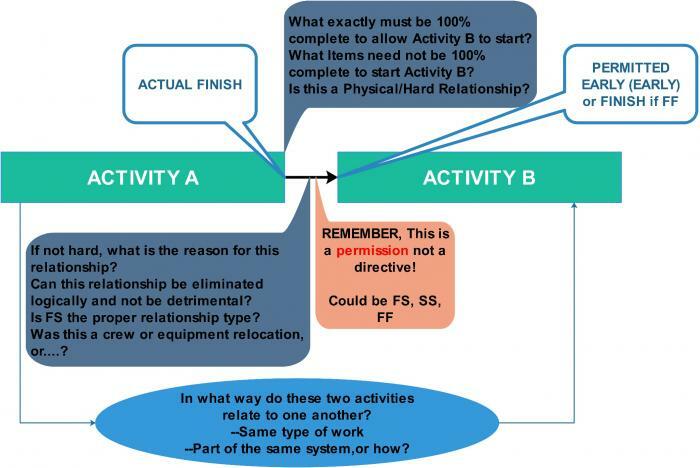 But, it is not mandatory (physically required) to make the connections as soon as the equipment is in- place, that is soft logic. There could be many other factors/work needed for connections to be made. But, that does not remove the hard logic. A CPM is supposed to be correctly-reactive. I.E., if the soft logic changes, which is very possible and the hard logic is missing the schedule workflow might collapse and indicate that the connections can be made before the equipment is ready for connections. The CPM will convey incorrect start date information and become illogical. 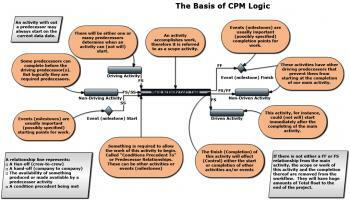 So fully understand how CPM workflow logic works and what it means. So, if by now you really desire to take CPM logic seriously and recognize that the CPM schedule is a dynamic process that should as pest it can respond correctly to the updating process then we will move on. The ability to automatically react to what is called out of sequence progress, which simply means what was really done does not matched the logic you designed. Well, as we started out on this paper, a CPM schedule planned future workflows, it was an estimate or educated guess, a plan forward we felt would be the correct way to do our work. For many reasons, it will change. This all means that the correct way to deal with out of sequence progress is to correct any historical logic to model what was actually done, providing a correct basis for moving forward. If you lie about what really happened, you will just continue to extend the lie and the schedule will never become in sync with the enacted project workflow. Unfortunately, many schedule specifications using P6 terminology tell you to user “progress override” rather than require that the schedule remains truthful and logic is corrected during the update process. If your mind is closed to what has been said, you won’t change and your schedules will tell lies rather than communicate the truth. I hope that at least a few readers will open their minds and strive to do a far better job scheduling and controlling their projects. WHY IS THE ABOVE SO VERY IMPORTANT FOR FIELD OPERATIONS? WHY IS THE ABOVE SO VERY IMPORTANT FOR REPORTING TO MANAGEMENT? WHY IS THE ABOVE SO VERY IMPORTANT FOR CHANGE ORDER MANAGEMENT? Your schedule will more closely stay in sync with the physical project throughout construction. Unfortunately, P6 has limited ability to deal with relationships and notebooks and UDFs cannot be attached to relationships though the author has begged Primavera to create this ability. The good news is that Asta Powerproject can fully label and deal with relationships (links).